Are the chest acne (chestne) bothering you for not being able to wear a swim suit, may be a V-neck or low-cut dress? Typically chest acne occurs in teenagers, but it can develop at any stage of your life. It is quite common in females due the breast tissues and menstrual cycles. But it occurs in men as well. Pimples, black tips, blackheads, whiteheads, nodular cysts, papules, pustules, cysts and even lesions develop on the chest due to very large number of the sebaceous (oil producing) glands on this part of the body. Chest acne is basically a swollen pimple and may be soft or red, which can not only be ugly but also painful. Chest acne treatment is very similar to the facial acne or acne on any other part of your body. In fact chest acne is quite similar to the facial acne in its characteristics and treatment. Fortunately, there are several ways to treat chest acne, and if you still have some signs or spots of acne or pimples remaining on your chest, then there are a couple of quick tricks to hide them. First we will tell you about chest acne causes and then will explain to you how to clear and get rid of chest acne at home with natural remedies? Chestne is generally caused by blocked pores, bacterial infection, and presence of large number of oil producing glands in the chest area (oily skin). In some cases heredity or hormonal changes can also be liable for acne on chest. (i) In summers when natural skin oil and sweat mix with dirt then they create a layer on your skin that blocks your skin pores on your chest and increase bacterial infection, which trigger acne break out on chest. (ii) Excessive use of cosmetics, deodorant, powders, sunscreen, foundation and lotions on chest can be liable for chest acne, as they can block your skin pores. 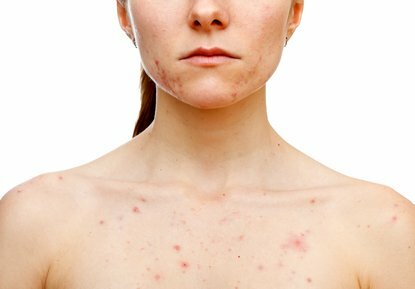 (iii) Acne bacteria can also be a reason for acne on chest. (iv) Imbalanced hormones can be a cause of chest acne. Imbalanced hormones upsurge oils secretion that can clog skin pores on chest. (v) In females menstrual cycle is directly linked to chest acne. During this period hormones like testosterone, androgen and growth hormones like insulin are in their overdrive phase, consequently they yield to larger number oil glands, which result into blockage of pores. How To Treat Chest Acne At Home? Chest acne treatment is easier than facial acne, as the skin on chest is slightly thicker and less sensitive than facial skin. You can treat acne on chest with natural home remedies or medicines. Try these natural remedies to treat this problem at home, and if you don’t get positive results, consult a dermatologist for medical treatment. 1. Prevent Breeding Grounds For Chestne: Take shower as soon as possible when you return from gym or beach. This way you rinse off all the oil, sweat, and sunscreen that build up on your chest or around hair follicles (in case of men), leading to chest acne. 2. Cleanse With Acne Fighting Salicylic Acid Soap / Cleanser: Use a shower puff and a gentle body wash, soap or cleanser containing 2% salicylic acid while taking bath or when you’re in shower. This acts as a drying agent that doesn’t let oils to clog on the pores or hair follicles. (i) Be careful enough to immediately wash the puff when you come out of shower, since it is a hotbed for bacteria growth. Also consider replacing it every 2-3 months. (ii) Cleansers / soaps containing salicylic acid work as sloughing agents, which help to control acne. (iii) Make sure not to scrub your chest or body roughly because it can lead to excessive loss of your skin’s natural oils, and it will irritate your acne. Also, the skin on your chest can scar easily, if you accidently remove or scratch the skin. Always scrub your chest and back very gently while bathing to remove the dead skin cells. (iv) A daily shower helps to clean your skin by curbing accumulation of bacteria, dead cells and oils, so it prevents occurring of acne. 3. Acne Fighting Cream: The cream should have a concentration of salicylic acid ranging from 0.5 to 2 percent. Apply the cream directly over your chest acne to dry it out and heal the affected area speedily. 4. Body / Face Wash With Benzoyl Peroxide: Benzoyl Peroxide fights the bacteria that cause acne, and helps in drying out and shedding dead layers of skin on the epidermis. But a word of caution here is that benzoyl peroxide tends to bleach fabrics. So, make sure to wear old shirt after its application. 5. Exfoliate Your Skin To Prevent Chest Acne: Exfoliating is a process by which the dead skin cells on the top layer of skin (epidermis) are removed. So, exfoliating can help in getting rid of chest acne and fade away the chest acne scars / marks gradually. One of the main causes for chest acne is clogged hair follicles or pores, which leads to build up of sebum. This causes acne formation. Men generally have chests covered with hair, and while women usually wear more tight-fitting bras and tops. Both of these cause chest acne. Thus exfoliation becomes more important to prevent and cure chest acne. Also make it a point to wipe down your chest area using a cleansing toilette or toner after too much of sweating during a workout. (i) Mud or Charcoal Mask: Rub this mask gently onto your chest twice a week, and then rinse it off. This mask will unclog and cleanse dirty pores. (ii) Mendelic Acid Mask: Apply this mask on your chest or back 10 to 15 minutes prior to shower, and then rinse the mask off with some specifically formulated acne wash.
(iii) You can even use a clay mask on your chest and back and see improvement in just 2-3 weeks. (iv) Even a mask containing tree oil is an effective remedy for chest acne, just like it works for facial acne. Tea tree oil is an effective treatment for a number of skin conditions. 7. Aspirin To Treat And Clear Chest Acne: Aspirin actually contains salicylic acid that works like a peel to the skin, and it dries out acne and reduces inflammation caused by acne. Crush 2 aspirin tablets and mix with 1 teaspoon of water and 1 teaspoon of honey. Apply this mixture onto your chest or other acne affected area, allow it to sit for about 15 minutes or until it to dries out and then rinse it off with cool water. How To Prevent Chest Acne? 1. Wear Cotton Or Linen Tops: To prevent acne-producing perspiration, try to wear only cotton or linen tops. They allow for maximum air in and out and also they allow sweat to evaporate instead of forming a layer on your chest and back, which can otherwise clogs your skin pores, welcome bacteria to grow leading to occurrence of pimples and acne. Also try to wear loose tops. Tight and fitted clothes can rub your skin tissues. 2. Use Non-Comedogenic Products: Avoid “Comedogenic” ingredients (such as cocoa butter, pigments and dyes, coal and isopropyl myristate, etc. ), as they tend to clog skin pores. Look for labels that say “non-comedogenic” or “oil-free”. Especially, if you have oily skin, you should always use non-comedogenic lotions and cleansers. How To Cure Chest Acne Naturally? (i) Make a salt soak by mixing together one cup of sea salt with 1 liter of water in a bathroom sink or a large container. (ii) Soak a washcloth in the solution and apply onto the cleansed chest area, shoulders and neck. Let your skin air-dry for about 2 minutes. (iii) Reapply the solution. Dip the washcloth again in the solution and saturate it. Wring the cloth a little bit without drying it too much. Dab the washcloth onto your chest gently. Let the solution air-dry. Wring and dip the cloth in solution again, apply it onto your chest again and then let it air-dry. Repeat this process 5-6 times. Throw away the solution left behind. (iv) Prepare a non-oily moisturizer that deters pimples eruptions and soothes the skin as well. Make sure to wait for 2-3 hours after applying the sea salt solution before applying moisturizer. To make a non-oily moisturizer at home, mix 2 tablespoons of buttermilk and 1 cup of sour cream in a small bowl and stir well. Apply it onto your chest and wipe off the excess with a soft tissue. (v) For stubborn pimples, apply calamine lotion onto your chest with a cotton ball. If you like, you can leave it on the chest area for whole day, or apply it before you sleep at night. This lotion will help in drying up sebum and prevent chest pimples. (vi) Apply calamine powder on your chest after taking bath. Chest pimples and skin rashes develop more often during summers or due to exposure to heat and humidity. Synthetic clothes, like polyester retain heat and irritate skin, leading to pimples, acne and other skin problems. So, to protect your skin wear a cotton shirt after applying calamine powder. (i) Cinnamon Powder And Lemon Juice: Topical application of cinnamon powder and freshly squeezed lemon juice is a common home remedy for acne on chest, back, face and other body parts. Mix 3 tablespoons of freshly squeezed lemon juice with 1 tablespoon of cinnamon powder and stir the mixture well. Use your clean fingertips to apply a thin layer over the affected area. Leave it on for about 1 hour, and then rinse it off with cool water. You can use this remedy daily, unless it causes irritation to your skin. In that case use it less often or discontinue it if required. (ii) Radish Seeds, Honey And Milk: A mixture of all these three ingredients is an effective natural remedy to treat chest acne, as well as back acne and blackheads. Combine 1 tablespoon each of radish seeds, honey and milk. Blend the mixture thoroughly to make a smooth paste. Apply a thick layer of this pack on the affected area, leaving it on for about 2 hours. Rinse it off with cool water and apply an organic mild moisturizer. You can keep this pack in an airtight container in your fridge for up to 5 days. It can be applied warm or cold on a daily basis. (iii) Toothpaste To Get Rid Of Chest Pimples: It’s a common home remedy to treat pimples / acne on chest, back, face and other parts of the body. Toothpaste helps to dry out pimples caused by over-productive oil-glands, which is generally the case with chest and back acne. Apply a thin layer of toothpaste over the acne infected area, using a soft brush or your cleaned fingertips. Leave it on for about 30 minutes or until it dries out. Gently rinse it off with cool water. Don’t use any soap to wash it. Apply this natural remedy daily as long as it does not irritate your skin. How To Treat Chest Acne Scars? Mix 1 teaspoon each of oatmeal, plain yogurt (unflavored & unsweetened) and sour cream thoroughly. Add in few drops of freshly squeezed lemon juice and stir well. Apply the mixture on the acne scars on your chest and back, leaving it on for 15 minutes or until it dries out. Wash it with water. It will help to diminish chest and back acne scars and slowly leading to their disappearance. (i) Avoid too much of fried and processed foods. Include in your diet vitamins and antioxidant rich foods. (ii) Don’t spray deodorant on your chest as it can aggravate acne. (iii) Avoid picking at your pimples or scratching or popping them. Doing this can cause further irritation, spreading of infection and scarring. (iv) Shower or cleanse after you work-out as your pores may be clogged with sweat after you work out. Wear athletic clothes made of cotton or such fabric, so that perspiration gets a way for evaporating and escaping. Choose a gym that provides a steam room or steam shower. Make it a habit to take shower after each workout to cleanse your pores and prevent acne / pimple flare-ups. (v) Any acne home treatment that you try could take up to 6 weeks to show results, so don’t give up too soon. (vi) Acne can be aggravated by stress, so try to reduce your stress in order to minimize chances of having a breakout. (vii) Do not indulge in excessive use of heavy lotion, sunscreen, foundation, powder on your chest to avoid clogging of the pores leading to acne breakout. If you are having severe acne on your chest or when nothing works out, consult a dermatologist. You don’t need to worry as he will prescribe proper topical application or oral medications to cure acne / pimples completely.